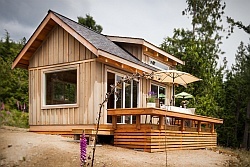 We came across this tiny jewel of a cottage on Airbnb. The “Tale Inn” is located in Fairhope, a town on the Gulf Coast south of Mobile, Alabama. 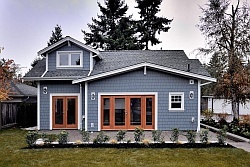 Its pleasing proportions, welcoming porch and authentic architectural details give it tremendous curb appeal. Like most homes in the South, the cottage features a gracious front porch. Although not large, the porch provides enough room for a couple of people to sit and chat on hot, muggy days. The cottage and porch are covered by a single hipped roof, a popular choice in coastal areas vulnerable to hurricanes. 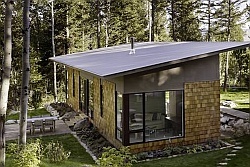 The low eaves on all sides give it better resistance to high winds than other roof forms. A large part of the cottage’s appeal has to do with the little dormer up on the roof and the real functioning window shutters (unlike the narrow tacked-on “shutters” on many tract houses that are clearly too small to cover the windows). But aside from the dormer and the window shutters, the front façade has little in the way of added adornment. 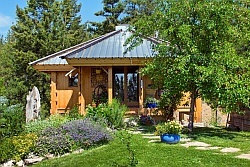 Basic board and batten siding is paired with a standard metal roofing profile, the porch columns are just unadorned 6×6 posts, and the window/door trim is quite modest. These elements, however, come together in a way that is much more than the sum of the parts. The small house has an open living space at the front, with the kitchen on one side and the living room on the other side. The front door leads somewhat abruptly into the kitchen area. There is no real entry area and no obvious place to leave shoes or umbrellas. Since there seems to be quite a bit of kitchen storage, I would consider moving the fridge and putting a coat closet in that corner by the door. The one bedroom and bathroom are at the back, under a storage loft. The bathroom is accessed from the bedroom, as is a small laundry room. A louvered opening between the living room and bedroom allows breezes to flow through the home. The interior walls all have beadboard paneling with plain 1×4 baseboard and ceiling trim. The inside window and door casings are again done in a fairly simple Craftsman style, but check out the curved head casing with decorative cutout over the front door. That just took a flat board, a jigsaw and a bit of imagination. Little details like that can take even a builder-basic drywall box from boring to breathtaking. If you’re going to be in the Mobile area, the Tale Inn cottage can be rented through Airbnb. Have a great Sunday! Photographs courtesy of Airbnb / The Tale Inn. I see some nice elements here, but then others that make me scratch my head. What’s the point of the column island in the kitchen area? Stools can’t fit under it, so how can you sit and tuck your legs under? Also, it’s so tiny that it hardly seems to provide enough flat surface area for two people to eat a meal anyway. 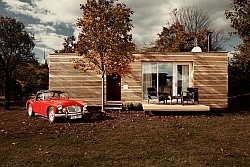 With space at a premium in a tiny home, one would hope to see a better solution. 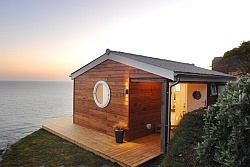 I LOVE, LOVE, LOVE this tiny house! A spacious main floor bedroom makes up for the somewhat cramped eating area. It’s PERFECT in every way! this house has potential. space is poorly apportioned and the decor is not welcoming. As a hotel room it is barely OK, but as a dwelling it needs a better kitchen lay out, a dining area, wasted space in the bedroom. vaulted ceiling anf beadboard walls are a plus. I love this cottage. Lovely photos too. Very cute cottage; I just love all the images of old movies and Bogart films it congers up! The bedroom is beautiful and spacious. Since there really isn’t much dinning space; a nice drop down leaf added to one side of the kit island (piano hinge) could lift up to just under the height of the island’s counter top and would be a great addition. When I was little, our dinning room wouldn’t accommodate a dinning table, so we had a small, very narrow drop leaf table that mom would lift the drop leaf up at meal time… I still have great affection for those drop leaf tables today.